2. Click on the departure date box to open up the calendar view and try other dates. Look for the date combinations that are currently showing as $684 CAD roundtrip including taxes. The price should show up as $683 CAD roundtrip on Flight Centre. vancouver, yvr, flight deals, air canada, asia, east asia, china, shanghai and pvg. 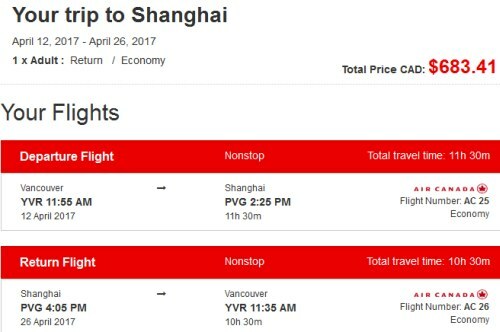 6 Responses to "Vancouver to Shanghai, China - $583 CAD roundtrip including taxes | non-stop flights"
Does flight center charge service fee? You can't get the subtraction of $100 from flight center unless your order (together with other reservations like hotel etc) reach at minimum $1,000. This is what I was told when called in today. Hmmm, that's the first time I've heard someone mention a minimum booking cost. If true, I would think someone would have mentioned it by now, as so many people have booked these flights. Maybe it was a misinformed agent? I will double check with one of the higher ups at Flight Centre. It could be worth calling again. Mark: Looking into this, I think the Flight Centre agent might have confused it with the 'Future Sale', which is a different promo they are currently running. If you check the details on their homepage, it mentions the minimum of $1000 per person for that promo. The Asia promo is still on until September 16th, and there's no minimum booking value. Thank you for the confirmation, Chris! I also visited Flight Centre branch at downtown, they didn't have this deal. I guess the stuff are not very familiar with this promotion. Wow, that's pretty surprising! It was right on their homepage for the last 2 weeks. I'll pass that info on to Flight Centre. They might want to do something about making their branches more aware of the current promos.